Newcastle United are NOT looking to sell Aleksandar Mitrovic – but Moussa Sissoko’s exit is edging closer. A report yesterday claimed the club was looking to offload the striker this summer. 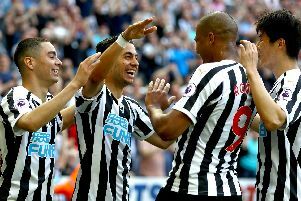 But the Gazette understands that Mitrovic – who missed Friday night’s 1-0 season-opening defeat to Fulham through suspension – is firmly in Rafa Benitez’s plans at St James’s Park. Mitrovic, signed from Anderlecht last summer, will offer Benitez a welcome extra option up front when he returns from his four-game ban. Sissoko, however, has reiterated his keenness to leave the club in the wake of its relegation to the Championship. The £35million-rated midfielder says he is “flattered” by interest in him from Real Madrid. Asked about reports linking him with the Spanish club and Manchester United, the 26-year-old said: “That’s flattering. “Who would not be flattered by the interest of one of the best clubs in the world, if not the best. “It’s simple. When you are young and you start playing football, your dream is to become a professional and play for a club like Real Madrid or Manchester United. Sissoko returned United a week ago after being given an extended break following his involvement with finalists France at Euro 2016. Newcastle manager Benitez has ruled out recalling Sissoko – who was not in his squad for the Fulham game – for Saturday’s Championship home game against Huddersfield Town, though there could be developments on his future before then. “Moussa was not match fit, because he came on Monday,” said Bentiez. Meanwhile, United have been linked with a loan move for 20-year-old Everton left-back Brendan Galloway.